This Valentine’s Day, many Kissimmee restaurants will be looking to capitalize on one of the biggest annual dining-out occasions in the U.S. They’ll get plenty of business according to consumer surveys. However, only 37% of survey respondents said they would celebrate with an evening out. Contrast that with 51% who said they would celebrate by sending cards, 49% will buy candy and 37% will purchase flowers. This doesn’t mean you won’t find the area restaurants busy. Plenty of diners are expected to fill the area’s restaurants. Market research anticipates a 3.7% increase in Valentine’s Day spending this year, despite fewer people celebrating by dining at Kissimmee restaurants. This increase is primarily due to the holiday falling on a Friday, allowing the celebration to span more than one night. If you are looking for a big party out this weekend, don’t worry. The night life in Orlando will be just as busy this weekend as ever…perhaps with a little more love in the air. The curious finding comes in the study that fewer Americans plan to celebrate the day WITH a loved one this year, 54% as opposed to 60% last year. Are we not feeling the love? The area’s restaurant chain that is capitalizing on this debate is TGI Fridays. They are asking their Twitter followers which side of the “couples vs. singles” debate they take, allowing fans to vote by tweeting with the hashtags #TGImTaken or #TGImSingle. Social media will also be the center of this restaurant’s promotion of the “wingman,” the important romantic helper and sidekick. The first 500 men or women to follow TGI Fridays’ Twitter handle and tweet at the brand using #thankswingman will receive a gift card. If you tweet, join in the fun! Many other Kissimmee restaurants will participate in national promotions competing for your business. Want a cake? Baskin-Robbins is selling heart cakes. Coffee and music anyone? 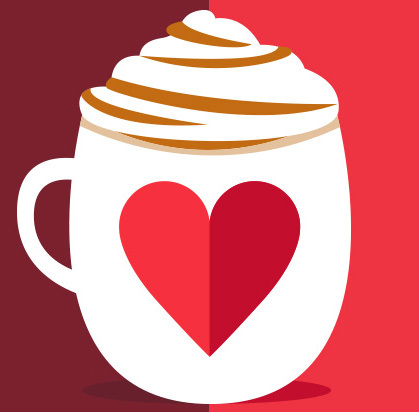 Starbucks has compiled love songs available on iTunes. What goes better with coffee than a Krispy Kreme Doughnut? 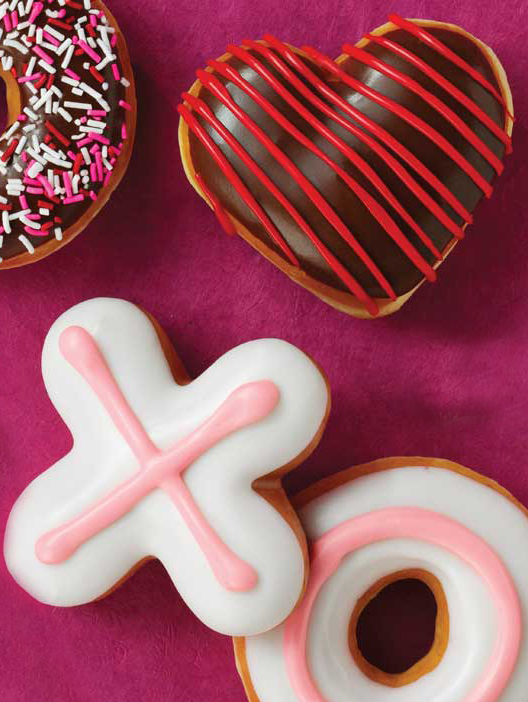 On Valentine’s Day, go for the hugs and kisses doughnuts. Yummy! Even Hooters is offering two 10-piece chicken wing orders for $14. Couples enjoy together, singles are encouraged to have them all to themselves on Valentine’s Day. 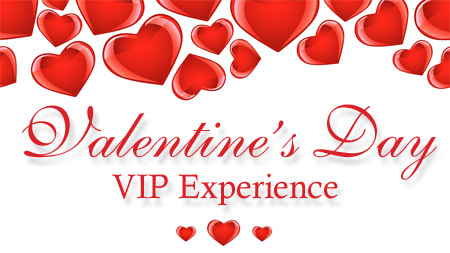 It would be difficult to beat the Valentine’s Day deal at the Kissimmee restaurant Capone’s Dinner & Show, especially if you want to treat the entire family. Yes, singles and couples enjoy the show equally, however, this speakeasy is the best option for an entire gang. There is romance, if that is what you are looking for. Plenty of action for the little ones to keep them interested, and tons of laughs for everyone. This Friday and Saturday the Kissimmee dinner show will offer two show times and all tickets are half price! To get this deal you must order online, or call in your reservation 407-397-2378 and tell them you want the internet deal. Whether you’ll be celebrating as a single, couple or a group this Valentine’s Day, enjoy the love in your life. Maybe it is a girlfriend, boyfriend, husband or wife, a parent, child, friend or a dog; but someone loves you. Take them out to a Kissimmee restaurant for breakfast, lunch or dinner (yes, there are restaurants that you can take your dog). Make a weekend out of it and have a happy Valentine’s Day!